· SWEATER PRO is especially developed for the sweater manufacturer. It served for both computerized knit ting and manual knitting. Therefore, it is user friendly and really meets the objectives of sweater manufacturers. · SWEATER PRO is Web-Based application. So you can work with Sweater Pro anywhere and anytime you need. You don’t need to worry about the flood, traffic jam, road closed or any unexpected circumstance that cause you cannot work at your office anymore. · SWEATER PRO has many features, including Materials Plan, Knitting Production and monitoring for each process which applies Barcode System for production tracking and control. Applying barcode system enables you to track the production progress real-time accurately. · Many standard forms, reports and summarized and analyzed reports that you can print immediately. · The sweater job order can be generated and printed by the system. For each job order, you can specify the order details, panels and the machine produce, size specification, materials list and consumption. · The process and the incentive of each process of the job order can be specified in the system. · The employee process coupon barcodes also can be generated by the system for gathering the employee output. · The system applies the barcode coupon system for accurate and real-time information gathered in the system. · The FG weight, the yarn and materials %usage and consumption can be specified in the system so the yarn and the materials required for each job order can be calculated automatically by the system. · It is very flexible for changing the yarn/ materials %usage or consumption. The system can recalculate the yarn/ materials required for each job order very easily and accurately. That causes you save much time for calculate the materials needed for the order and reduce human errors. · The Materials Usage for each job order, each size, and each piece can be calculated and printed out by the system. · Materials group and materials master data including lot no. need to be generated in the system. · Materials receiving transaction can be recorded in the system and also materials receiving note can also be printed out from the system. · You can book the yarn and materials for the job order in order that you can request the right yarn and materials that have already booked for the job order easily. · Materials Issue and return also can be done by the system. · Many Yarn & Materials balance and movement reports can be view and printout very easily and real-time. · Yarn Spinning In can be recorded in the system by scanning or specifying the weight of spinning yarn and the spinning yarn box coupon barcode sticker can be printed out from the system for attaching the yarn box. · Yarn spinning out also can be updated in the system by scanning the box of spinning yarn for accurately and real-time information. · Yarn balance and yarn spinning balance report can be viewed and printout by the system. · The knitted output and weight can be updated in the system by barcode scanning for accurate and real-time information. · The machine performance, staffs performance, daily output and summary output by panel /by piece Reports can be viewed and printed very easily and in real-time basis. · Each process of production can be controlled and updated by barcode system. The barcode system enables you track the progress of your production very easily and accurately. · The processes that you need to monitored can be defined yourself in the system such as panel inspection, linking, mending, washing, pressing, labeling, buttoning, sewing, QC , etc. 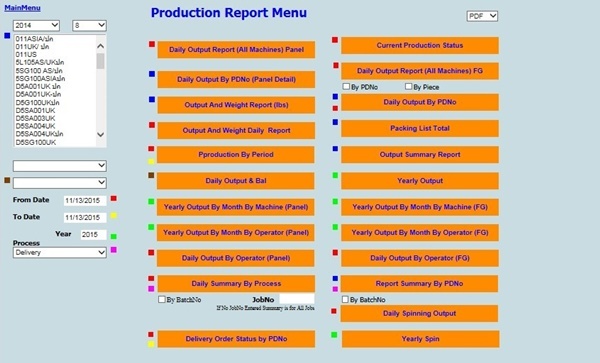 · Many production progress reports that you can track the production progress. You can see the output of each process and also the overall production progress of each order that you need. That causes you can monitor and manage your production very close and the shipment can be delivered to customer in-time. 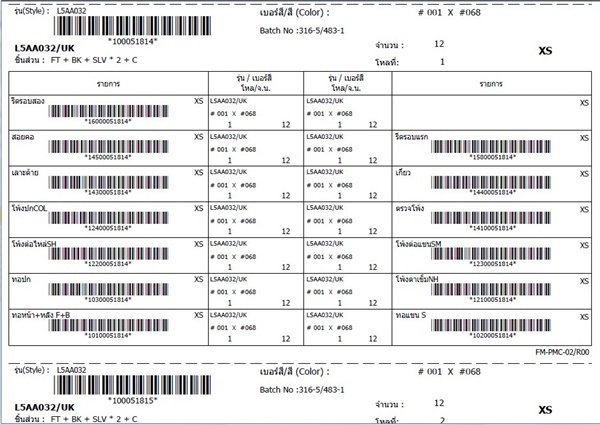 · Piece rate employee coupon can be printed out and scanned in the system for employee output tracking. · The price of each process can be defined in the system for each order for piece rate wages calculation in the system. · The reports of employee outputs and piece rate wages of each employee can be printed by system. The HR department can use the reports for preparing the payroll report more easily. Moreover, you can know the performance of each production staffs, manage the production line and improve the staff performance suitably. · Packing List can be generated and printed out by the system. · You can print box barcode sticker for attaching box. And you can scanning box barcode for controlling the movement of finished goods from sending box to warehouse, warehouse receiving, until creating the delivery order to customer. That enables you can monitor the status of your finished goods. · The delivery order can also be generated by the system for sending to the customer. · The finished goods balance and movement reports and pack status reports can be viewed and printed out by the system.